State-of-the-art computerised machinery was installed to offer a fast, efficient and competitive service. These machines can manufacture large tonnages of steel every day. The company is fully CE; CHAS; ISO 9001 & Constructionline accredited. Currently we have a work force of 55 people and an annual turnover of £6.5 million. Glendale Engineering offers the complete package of structural steel work from planning, design, manufacture and erection. 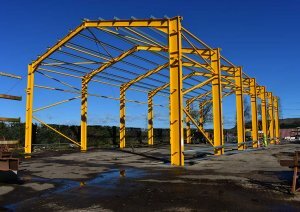 Commercial Projects & Agricultural Buildings can range from 5 tonnes of steel to 1,500 tonnes. 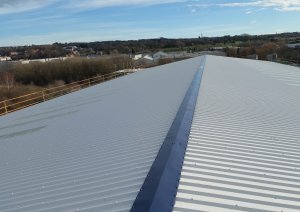 To view our recent contracts please visit our projects page. Glendale Engineering specialises in the manufacture of our own range of livestock equipment. From our award winning Remote Controlled Cattle Crush to Feed Trailers; Sheep & Cattle Handling Equipment; Feed Troughs and much more. We approach our work as a professional team and with the highest standards of integrity. We treat each other with respect and as we wish to be treated ourselves. Our vision is to become the preferred construction, manufacturing and farm equipment supplier for our clients by being trustworthy, reliable customer orientated and adding value. We will achieve this goal by being creative, driven and disciplined. We want to be the benchmark by which others are measured. We take our position in the local community seriously and are proud to support Charities and Community associations throughout Wooler and Glendale. We sponsor Wooler First & Middle Schools; Wooler Football Club; The Glendale Football League for Children; Wooler Cricket Club; Wooler Golf Club; The Drop-In Centre and various local individual causes.